Honestly, just sitting down and writing this wedding story today is making me get teary-eyed. I never thought that when I published my first post three years ago that this blog would reach all corners of the world, and would be read and enjoyed by couples as far away as Australia, New Zealand, the USA and Canada, and right here in Europe too. And to have couples go out of their way to contact me to let me know about how the blog inspired them or to ask advice about their own ceremonies, well that too was so unexpected. As was the beautiful email I got from bride Michelle, all the way from Ontario, Canada. Michelle and her husband Adrian were married last year in a beautiful Taizé-inspired ceremony. I had never even heard the word Taizé before, let alone had any knowledge or appreciation for how a ceremony could be infused and inspired by this beautiful spiritual movement. Michelle basically contacted me to offer to share her and Adrian’s beautiful wedding, because whilst the idea of sharing something so personal and intimate was out of their comfort zone, they really wanted to share the beauty of what they did to help others looking for something similar. Michelle had been frustrated by the lack of information on the internet about Taizé spirituality, especially in terms of getting married and so this inspired her to share their lovely wedding story here at Engaged and Ready.com. And yes I am so over the moon that they did! Before we get a better understanding of Taizé spirituality and how it influenced Adrian and Michelle’s marriage ceremony, let’s get to know them a little better and learn about how they lead to this style of ceremony. So here Michelle takes up the story. Adrian and I met through mutual friends in the spring of 2012. We had a very slow start to our relationship as we were living in two different countries, so only saw each other every few months. I am a professional costumer and was living and working for a ballet company in Princeton, NJ and Adrian was living and working in Ottawa. We had an appreciation for each other’s creative work, but we also could talk about anything for hours. We had similar backgrounds (I spent part of my childhood living close to the Canadian border). We were also both single at an age when most people are married and settled down, and we shared similar values and interests. Almost every date we went on for two years was to a museum or concert. We always had a wonderful time together. We travelled a lot to see one another and explored every city in between. Because of the nature of my work, I always have quite a bit of time off in the summer. After two years of dating long-distance, Adrian invited me to spend the summer with him, so I went to Canada. We had an amazing time together that first summer, but I wasn’t ready to give up my independence or the job that I loved and move away from all of my friends and start over in Canada. So at the end of the summer we parted and continued a long-distance relationship. The following summer I went to Canada again, but as the end of our second summer together approached, we both realized that we wanted to have a permanent life together. One of the hardest things I have ever done was to tell people at my job that it would be my last season – they were truly like a family to me and I did not want to leave them. But I did tell them and when I left Adrian to go back home to work, we knew that by the following summer we would be together. There was never any proposal or engagement ring – by that time we’d been dating 3 ½ years long-distance and we were just relieved to know we would finally be together. Later in the spring we learned that my family would be coming to visit us in Canada, so we decided to plan a small wedding to coincide with their visit. We set a wedding date and were married a little less than two months later. Adrian and I both knew that we wanted a very uncomplicated, quiet wedding with just immediate family, however, Adrian happens to have a very large family so that ended up being 35 people. I first thought we might have a simple ceremony outdoors, but Adrian wanted to get married in his family’s church, which I completely understood. 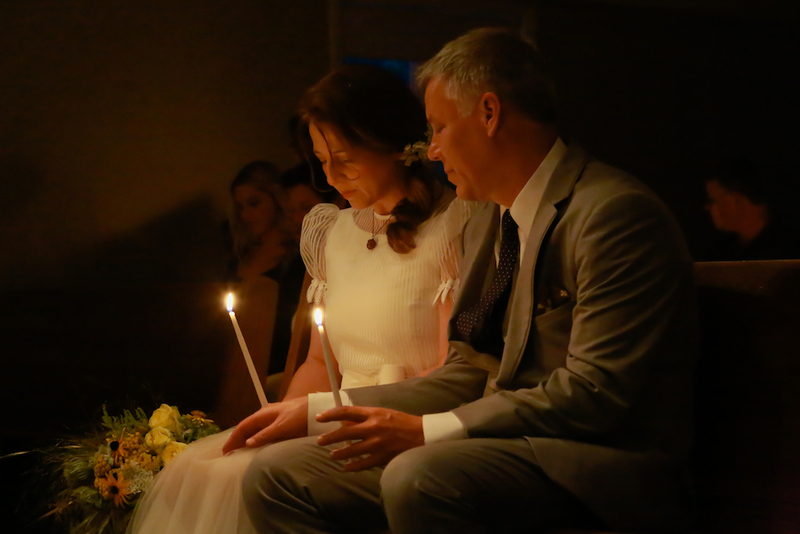 It was also important to us that all of our guests feel welcome and at ease – even those who might not otherwise regularly find themselves in a church, so we decided to structure our wedding ceremony around a Taizé prayer service. Taizé is an ecumenical community that relies heavily on meditation and music in their services. I first encountered this type of service when brothers from the Taizé monastery in France visited the chapel of Princeton University. Taizé prayer services are incredibly serene, and very beautiful as they occur in candlelight with long, peaceful interludes of silence. The spirit of Taizé emphasizes a life of simplicity, kindness, and reconciliation of people of divergent traditions, as well as care for strangers and compassion for all people. Those were values we wanted to bring into our marriage. We wanted our wedding day to be relaxed and meaningful for everyone who attended. We wanted to avoid having the things that the wedding magazines say you must have but really don’t bring any significance or joy to the event. We didn’t look at wedding blogs, read planning guides, or register for gifts (we told our guests that since finding each other we had everything we could ever need and that their presence in our lives was present enough). I think mostly, we just wanted the day to be about love and commitment and family, so we planned a simple, heartfelt ceremony followed by a vegan meal. Our ceremony began at 7:45 PM on a warm, rainy night in late summer. The sanctuary was lit only by candles and fading sunlight. All members of our wedding party were children. Adrian’s oldest son and daughter were our witnesses, his middle sons were ushers, his youngest two daughters were flower girls and my two young nephews were ring bearers. Adrian was waiting for me in the sanctuary and I walked down the aisle by myself over the yellow rose petals scattered by his two youngest daughters. Once I got inside the sanctuary and saw my family there, I had to stop and give some hugs on the way to the altar. It was pretty relaxed, so why not? The nicest part for me was that Adrian had decided to surprise me by asking my two little nephews to stand with him at the altar since I had his two youngest daughters walking with me. I loved seeing their little faces at the end of the aisle and they took their responsibilities of supporting and encouraging the groom very seriously! We actually did not spend long at the altar. We participated in most of our wedding ceremony as members of the congregation, in meditation, sitting together in a pew. We only stood apart from the congregation briefly for the exchange of vows. We chose the music, readings, and progression of the ceremony based on the format of a Taizé prayer service. Despite designing a unique ceremony, our vows were traditional and chosen by our pastor – though he would have happily allowed us to write our own, both of us simply preferred to recite traditional vows. One of the most special parts of a Taizé service is ‘the sharing of the light’ where each person lights her candle from her neighbour’s candle and the sanctuary is illuminated by candlelight for a period of meditation, music, and intercessory prayer. Adrian and I lit our candles at the altar, passed the light to his children and they in turn to the full congregation of our family. I knew that I would be missing my closest friends at home (and I was!!!) so before I left the United States, I visited with as many people as I could and invited them to sign their name in gold ink on a large glass candle holder. This candle was lit and stood beside me at the altar when I recited my vows. I told them that the light they brought to my life would be there even though they physically weren’t with me at our wedding. Taizé services are so beautiful but I wasn’t able to find any information about using a Taizé format for a wedding, so I was really nervous to talk to the pastor about it. Luckily, when Adrian mentioned to his pastor that we were thinking about basing our ceremony on a Taizé prayer service, he was supportive of the idea and happy to officiate. Not only was he familiar with Taizé and enthusiastic about bringing the spirit of Taizé to our wedding, but also he’d always wanted to lead a Taizé service in our particular church (but being relatively new to our church, had not yet had a chance). He was so open to our ideas, and always put us at ease because he so clearly understood the feeling we were trying to create in our ceremony. He made it so we did not have to worry about anything and he helped our guests from different religious traditions to feel included and at ease. Everyone just followed his lead during the ceremony and it was beautiful. Our pastor was easy-going and knowledgeable. He was the perfect officiant for us because he already knew us and he was a wonderful partner in preparing our ceremony and seemed to instinctively understand our wishes. For us, the wedding was the ceremony – it was the most important part. 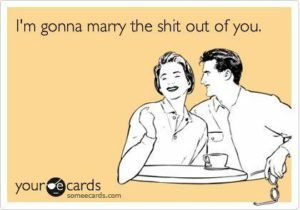 In our lives we’ll all plan many celebrations, but hopefully we’ll never plan another wedding ceremony! The key is understanding that your ceremony is whatever you want to make of it, so make it meaningful. I cannot thank Michelle and Adrian enough for coming forward and wanting to share their beautiful wedding story. Preparing their story for this feature has filled my heart. It’s so beautiful to see a couple making their ceremony their own and having the support of an understanding and thoughtful officiant to help them with it. Photography – Marcus Pearson www.lomar.net, except for the last two photos which were taken by groom Adrian on their honeymoon. They got dressed in their wedding clothes and took some more photos using just a camera and tripod. Amazing! Right? Bride’s dress – Michelle’s mother’s vintage blouse paired with a tulle skirt made by the bride herself! Incredible! Bride’s bouquet – Wildflowers and arranged by Michelle’s mother. Is it okay to ban children from your wedding? Come and meet Marriage Minister Marie Burns Holzer. You’ll officially love her! What’s a wedding celebrant and should we have one for our ceremony? You’ve got to see these funny as hell Valentine’s Day cards and then try and choose just one! Natasha Johnson is an experienced Wedding Celebrant, blogger and writer on all things related to weddings, in particular wedding ceremonies. Her mission is life is to encourage couples to see the importance of their wedding ceremony and to get married in just the way they want to. Make sure you catch her on the Engaged and Ready Wedding Podcast, here or on iTunes and Stitcher. LINKS TO AFFILIATE BRANDS I LOVE! Have you heard the Engaged and Ready podcast? This should be everyone’s ceremony goal!